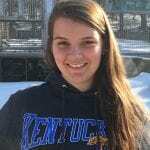 Michelle Meeker is a student at Eastern Kentucky University in the Animal Studies program and is a resident of Lexington, KY. Michelle began volunteering on-site at the sanctuary in January 2016, while also going to school full time and working at DSW. Michelle is always so positive and friendly and a great person to work alongside. In her free time, she loves spending time with her family and her dog.